This entry was posted in Version history on 18 July 2013 by frogsparks. 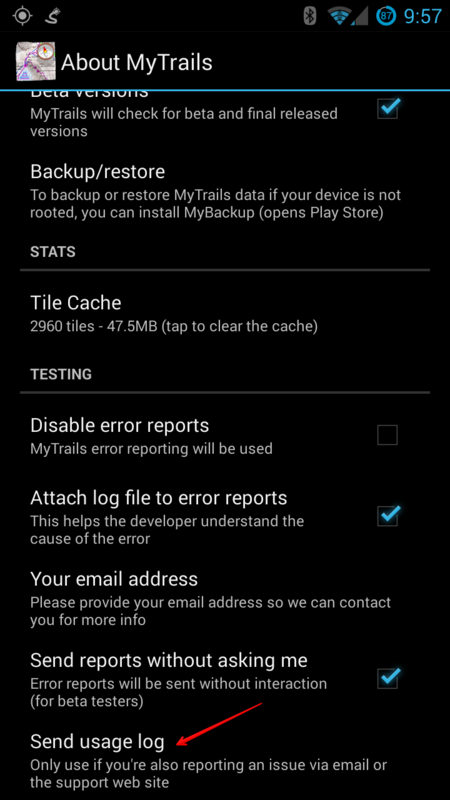 The new Play Store rules prohibit MyTrails from self-updating, so while it can check for updates (including optionally beta versions) on startup, it can no longer download and install the update, but must instead wait for the Play Store to perform the update. ​​This can be done on the web or a device, and it’s reversible: if you want to leave the beta program, just go back to the link in step 2 and deactivate the beta (if you’re currently using a beta, you won’t be automatically down-graded to an earlier release). All users are advised to set the Play Store to auto-update all applications. If you like to keep track of updates, Changelog Droid is a great app for that (and more). This entry was posted in FAQ on 15 July 2013 by frogsparks. We’re partnering with Giscover and Armor-x case manufacturers (they make hardened cases and bike mounts) to have a presence on this huge show. Look for us on booth A7-207. I won’t be there in person, but Massimo Nicolodi of Giscover will demonstrate MyTrails. We’ll announce a more in-depth partnership soon. This entry was posted in Blog, Press on 10 July 2013 by frogsparks.